Nothing says luxury travel quite like an overwater bungalow. These freestanding hotel rooms, which often sit just feet above some of the clearest waters in the world, are one of the most sought-after lodging options available. These are no ordinary thatched roof huts. Many feature huge, luxurious rooms with private splash pools, sundecks, and butler service. Opulent overwater bungalows are iconic to the South Pacific and Maldives, but you'll also find them in Malaysia, Central America, and the Caribbean. The obvious downside of overwater bungalows is the price. Depending on where you stay, you could easily pay $1,000 or more per night. The good news is you can book some overwater bungalows with rewards from some of the biggest hotel loyalty programs, many of which have co-branded credit cards that help you rack up rewards quickly. If you don't like those options, there are other ways to cover your overwater vacation with credit card points. To be sure, most of these bungalows require more points than a regular hotel room. But if you've accumulated a healthy stack of points, it may be worth blowing them on these dream accommodations. 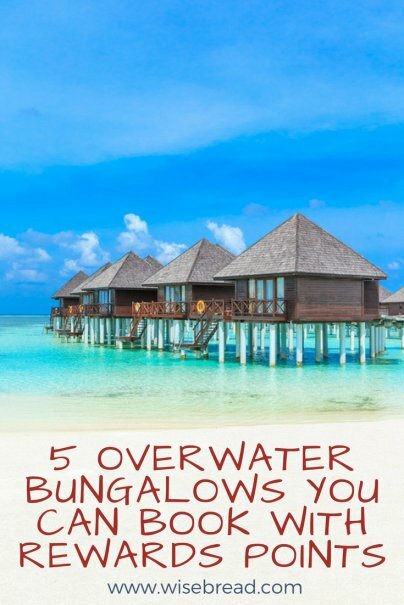 Here are some of the overwater bungalows you can book with rewards. A beach villa or basic overwater villa starts at 95,000 Hilton Honors points per night, while overwater villas with special amenities and views can cost a lot more. In May of this year, for example, a "retreat" water villa with lagoon views, a whirlpool, a sundeck, and a spa treatment room would set you back 308,000 Hilton Honors points per night. The cash price for overwater villas typically starts at over $500 per night, but can surge to nearly $1,000 per night during peak travel times. Hilton Honors members with Gold or Diamond status may also be able to book a regular room and be upgraded to an overwater bungalow, though Diamonds would get preference for those upgrades. Fortunately, you can get elite status with several different Hilton credit cards. Keep in mind, however, that just getting to the Maldives can be pricey, and you need to book an expensive private boat transfer or seaplane to get here. The round-trip seaplane transfer offered through the Conrad costs $500 per adult and $250 per child under 12, for example. The Conrad Bora Bora Nui Resort and Spa offers spectacular sea views, a supreme location in Bora Bora's lagoon, and a wide range of room options. Whether your goal is simply taking in the views, snorkeling with sharks or stingrays, or relaxing with one of the resort's spa treatments, you won't be disappointed by this property's location or amenities. In addition to these options from the major hotel brands, certain flexible travel credit cards that offer travel credit make it easy to book any lodging option you want, including overwater bungalows. Cards like these allow you to redeem points you've earned for either a statement credit that you can use to pay for a travel purchase, or for reservations that you book using the card's travel portal. Often, you'll be able to use your points at a value of around a penny a piece, meaning that a $400 room will cost 40,000 points. Some cards offer even better redemption rates. If you decide to book an overwater bungalow using flexible travel credit, you can score some that require fewer points than those in the pricey overwater bungalow havens like the Maldives, Bora Bora, and Moorea. Take the Holiday Inn Resort Vanuatu, for example, which offers overwater bungalows with a king bed starting at $296 per night. Or consider the Pangkor Laut Resort in Malaysia. Here, you'll find overwater bungalows that start in the $400 per night range. You can save even more by booking a resort closer to home. There are many overwater options you could book with flexible travel credit that don't require days on a plane or ridiculous nightly rates. Roatan Island sits squarely in the Caribbean Sea off the coast of Honduras, which is in Central America. That means getting there from the U.S. takes a lot less time and usually costs less than flying to Bora Bora or the Maldives. In addition, you can find hotels that offer overwater accommodations for a fraction of the price of those in far-flung locations. Anthony's Key Resort is a family-owned hotel that offers wooden bungalows perched over a tranquil lagoon. Although it doesn't have much of a beach, it does feature scuba and snorkel packages in what is considered one of the best diving locations in the Caribbean. A 400-square-foot "Key Deluxe" villa with Honduran hardwood finishings, a cozy hammock, and a private covered deck starts at $539 per night. Another option closer to home is St. George's Caye Resort in Belize. Situated on a private island in the Caribbean, this resort is reachable after taking a short boat ride from Belize City. Fortunately, you can fly many airlines into Belize, including discount carrier Southwest Airlines. You'll also find luxury overwater bungalows in the Central American country of Panama. Azul Paradise Resort offers deluxe bungalows with a king bed, Wi-Fi, proximity to the rainforest, and a full wraparound deck with a hammock starting at $425 per night for two adults. The 500-square-foot overwater space makes it easy to enjoy your own nautical paradise without staying too far away from attractions like the Ngobe Bugle Indian Village and local wetlands, and adventure activities like zip-lining, snorkeling, paddle boarding, and sailing. Whether you're using flexible travel points or points specific to a particular hotel chain, the cheaper the overwater bungalow you book, the fewer points you'll need to cover your stay. As with any other type of travel, shopping around for the best deal can help you stay in an overwater bungalow at a price you can afford.